Built in a sagebrush landscape along the mighty Columbia River in the heart of Washington wine country, the Ste. Michelle Wine Estates WSU Wine Science Center is a hub for innovation, education, and collaboration. The state-of-the-art Wine Science Center was developed in close partnership with the wine industry. 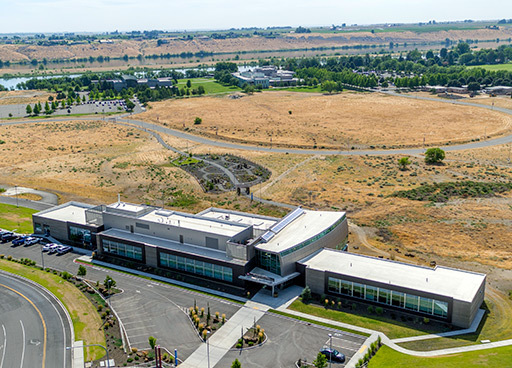 This teaching, research, and extension facility is among the most technologically advanced wine research and education facilities of its kind in the world, transforming the Washington wine industry with cutting-edge science in the tradition of its forefathers, Dr.Walter Clore and Dr. Charles Nagel. This 40,000-square-foot facility includes an open atrium with a wine library, research and teaching laboratories and winery, and classrooms and meeting spaces. The $23 million building now features high-tech equipment and is home to faculty and researchers who are educating future wine industry leaders and rolling out research that improves the grape-growing and winemaking process. The open, naturally lit atrium has curved windows supported by metal beams that are reminiscent of a wine barrel. With a capacity of 164 people, it’s a great place to study and host celebrations and educational seminars. The Donor Wall recognizes the financial contributions that were required to make the Wine Science Center a reality. Designed by Db Studio at Barnard Griffin Winery artist Deborah Barnard, the donor wall represents views that a wine scientist might see under a microscope, such as yeast cells, molds, crystals or bacteria. The microscope “slides,” infused with reactive glasses to create shading and depth, are overlaid with clear glass framed in oak with donors’ names embossed in black glass powder. All materials used were made in the Pacific Northwest. 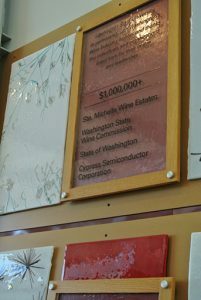 The Wine Library has the capacity to feature 1,800 bottles of Washington’s premium wine selections curated by the Washington State Wine Commission. Students and instructors conduct hands-on experiments and practice vineyard tasks on the Cabernet Sauvignon, Merlot, Syrah, Chardonnay, Gewürztraminer, and Riesling wine grape varieties grown in the two-acre vineyard on 9 different training systems. This two-acre garden was designed with sustainability in mind. Of the 600 plants featured, 80% are native to the Tri-Cities’ area natural shrub-steppe habitat, providing an example of the ingredients—climate, soil, plants, and insects—that make up southeastern Washington’s unique landscape. A tiered classroom designed for wine tasting with large, stain-proof tables to accommodate trays of glasses and students’ note-taking supplies. The wide aisles and ramp allow for pushing carts to all tables with ease and afford access to people with disabilities. The front wall is both a whiteboard and a projection surface, and the room is connected to state-of-the-art video conferencing, audio, and projection equipment. This room seats 20 people, is equipped for videoconferencing, and has a whiteboard wall. A series of four state-of-the-art laboratories, each designed for a specific function and shared by research faculty. A laboratory with gas and liquid chromatographs, mass spectrometers, and spectrophotometers including space for four operators. The split-bench design allows for easy access to maintain the equipment, and gas canisters are stored safely in hallway closets. Connected to the Instrument Room, this lab has space for 16 people and contains high-tech equipment to analyze wine chemistry and four large fume hoods to safely ventilate hazardous or toxic fumes, vapors, or dusts. A laboratory for studying microbiology and biochemistry with space for 20 people. The J.L. Stubblefield Trust, James Hayner Trustee Plant & Tissue Culture Room is attached to this lab with double doors to provide a vapor lock for incubating microbial and molecular cultures. The attached Zirkle Fruit Plant Preparation Room can be directly accessed from an outside door so plant and soil samples can be brought in without spreading debris in the hallways. The Viticulture Lab has space for 12 people and a fume hood. Cypress Semiconductor Corp. in California donated the most technologically advanced fermentation system in the world. Its 192 stainless-steel fermentation vessels, manufactured by Spokane Industries, are individually temperature controlled, continuously monitor sugar concentration, and automatically mix wine on individual schedules. The fermentation vessels are connected by wireless monitoring systems that provide real-time data to a central computer, allowing the winemaker to track and record all fermentations simultaneously. This lab includes five sensory evaluation booths, each equipped with a red light to obscure wine color, and a sample preparation area. The gas chromatographs in this laboratory allow humans to become detectors. They can isolate one or a combination of aromas and safely puff them out in front of an individual’s nose to test which ones they can accurately identify or to help discover new aroma compounds.